A free, public Loyola University New Orleans lecture Tuesday, Jan. 21 featuring Bahamian contemporary artist Tavares Strachan will discuss forms of extreme art through his own artistic quest of radical environments from outer space to the depths of the ocean. The event, part of Loyola’s annual Art and Design Lecture Series, is set for 2 p.m. in room 133 of the J. Edgar and Louise S. Monroe Library. A current resident of New York City, Strachan is a conceptual, multi-media artist whose work investigates science, technology, mythology, history and exploration. “The Distance Between What We Have and What We Want,” one of Strachan’s most iconic projects, consisted of a 4.5-ton block of ice harvested in a river near Mount McKinley, Alaska. Federal Express shipped the ice to the Bahamas, where it was exhibited in a transparent refrigerated case in Nassau. Solar power kept it frozen. Over the past decade, Strachan has worked on artistic experiments with the Bahamas Aerospace and Sea Exploration Center and trained as a cosmonaut at the Yuri Gagarin Russian State Science Research Cosmonaut Training Center in Star City, Russia. Strachan’s experimentations with extreme conditions have been the basis for exhibitions at the University of Pennsylvania’s Institute of Contemporary Art, Grand Arts in Kansas City, Mo., and the Massachusetts Institute of Technology List Visual Arts Center, among others. 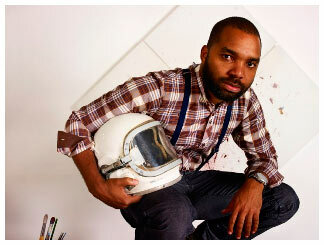 In 2013, he represented the Bahamas in the country’s first national pavilion at the 55th International Venice Biennale. After studying painting and liberal arts at the College of the Bahamas in Nassau and at Brown University, he received a Bachelor of Fine Arts from the Rhode Island School of Design, where he studied glassworks. He also holds a Master of Fine Arts in sculpture from Yale University.